You guyyyyyys! I’ve reinvented an old recipe! 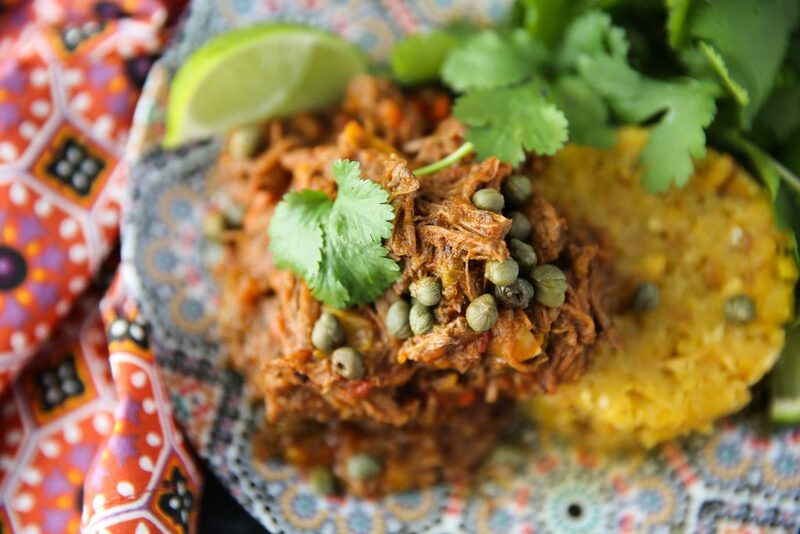 I took my Crockpot Ropa Vieja with Cuban Style Rice and made into a new instant pot recipe! I made this recipe with a round roast from ButcherBox, but you can use chuck roast or a rump roast, whatever you have on hand! And don’t forget, right now if you sign up for ButcherBox (a meat delivery service, delivering grass-fed, grass-finished, humanely raised, chicken, beef and pork right to you doorstep!) you can get 2 Free Filet Mignon (2x6oz) + Free Bacon + $10 off your first order! But this deal only lasts until the end of March, so be sure to act now before it’s gone! One of my favorite things to do in Denver is try different restaurants. Sure, we have mountains and a million things to do outside BUT, we have really awesome food. And I take advantage of that every week. I’d love to say I only take advantage on weekends, but I usually stop by some of my favorite restaurants during the week, too. I have a problem. And one of my favorite places I recently ate at was Candela Latin Kitchen. At this restaurant, I tried mofongo for the first time and instantly fell in love. Then I saw Bobby Flay on Beat Bobby Flay making mofongo and I took it as a sign that I needed to try it out myself. 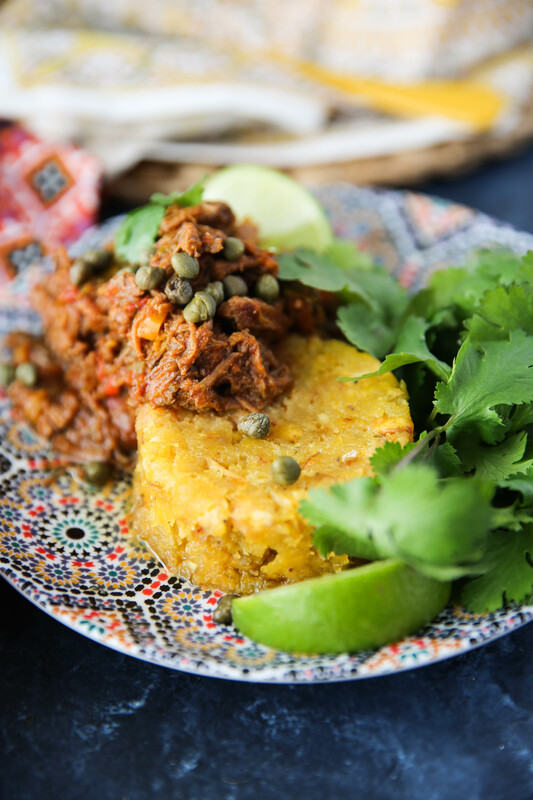 If you’ve never heard of mofongo, it’s pretty simple. It’s green plantains fried and mashed up in garlic, salt and fat. It’s usually is also mashed with pork rinds, but I think pork rinds of kind of gross for some reason, so I left that out. I’m sure someone will get upset with me for not making it EXACTLY like the original, but I do what I want around here. 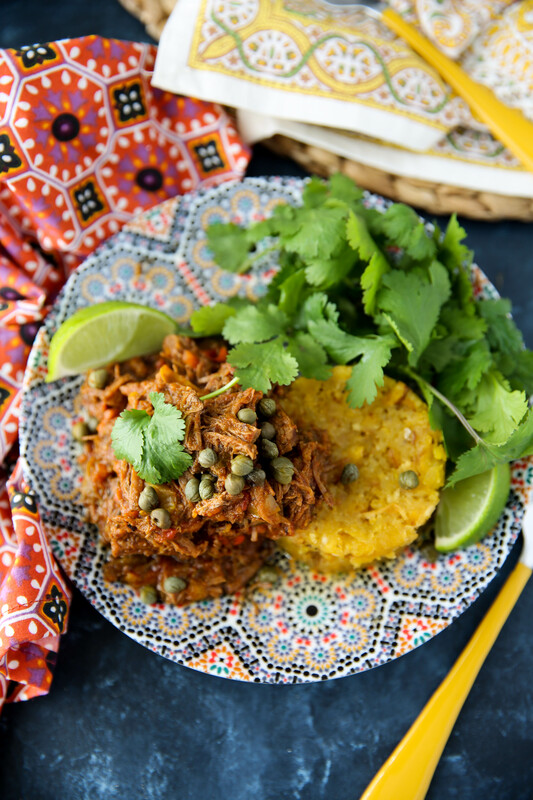 Like mixing Cuban and Puerto Rican recipes together! No need to get upset. Just eat the food. Speaking of food, a new Shake Shack just opened up in Denver. And I really want to go because I’ve only been once and it was a catered event so I couldn’t choose what I wanted to eat, meaning gluten free. I told my SIL that we should go this weekend but she said the line is wrapped around the restaurant. And I ain’t about that kind of wait. I’d much prefer eating somewhere else and waiting a couple months until it calms down. Now we just need an In-and-Out and we’ll be set. Who am I kidding? I would only eat at these places once a year so what do I care. We have too many truly amazing restaurants to eat at. Have you seen my blog post about my favorite restaurants in Denver? I keep adding to it as I try more places! You guys. My 30th birthday is officially a month away! And guess what I’ll be doing? I’ll be sailing the Caribbean on a TradeWinds boat with my husband and whoever else is on the boat! Did you see my blog post about my first TradeWinds trip in August? It was THE BEST trip of my life which was kind of a bummer since my husband couldn’t be there. But he will be on this trip and this time we are going to Guadeloupe. I’ll probably talk about it 64 more times in the next month because I’m so freaking excited! Eeeeeeeek! Place the basin in the 6 quart instant pot then press the sauté button. Add ghee then once hot, salt the cubed roast then sear on all sides, until browned, about 5-8 minutes. Once seared, press the cancel button. Add garlic cloves and spices then mix to combine. Lastly add onions, peppers, tomato sauce, diced tomatoes, broth, bay leaf and capers. Secure the lid of the instant pot, close off the pressure valve (if needed) then press manual and press the up button until the time hits 30 minutes. Once time is up, quick release to let the pressure out then remove lid and press cancel. Remove cubed meat and use two forks to shred completely. Then add the shredded meat back to the instant pot. Press the sauté button and let cook for 30 minutes, mixing every couple minutes to keep the mixture from sticking the bottom. This will reduce and thicken the mixture by more than half. Remove and discard bay leaf before serving. 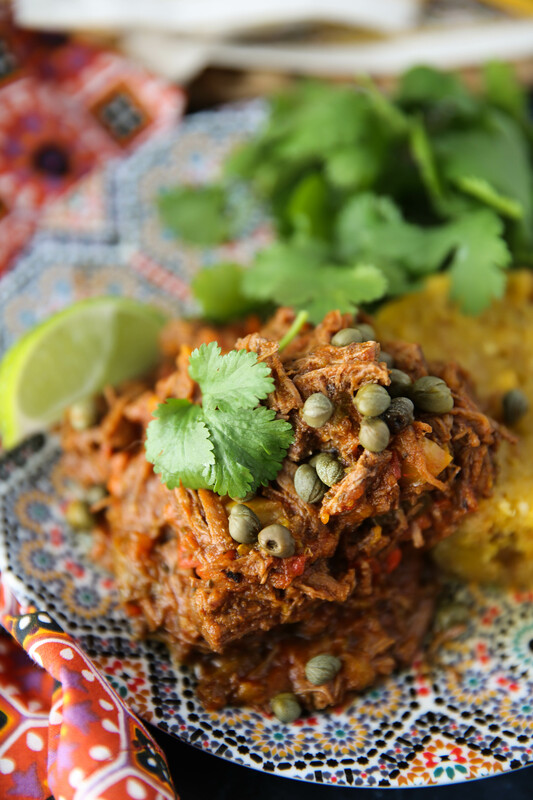 While the ropa vieja reduces, place a medium sauté pan over medium heat. Add 1/4 cup lard. Once hot, place the plantain discs in the fat to cook for 3-4 minutes per side, until golden brown. You will need to do this in batches. Once cooked on both sides, set on a paper towel and salt while they cool. In a stainless steel bowl, add plantains, minced garlic and salt and use a potato masher to mash the plantains. As you are doing this, begin to pour some of the lard (from cooking the plantains) into the bowl while you mash the plantains. I used all the of the leftover lard from my pan, but you may need less or more just depending on your plantains. The mashed mixture will stick together when it has a sufficient amount of fat. If it crumbles, add more! 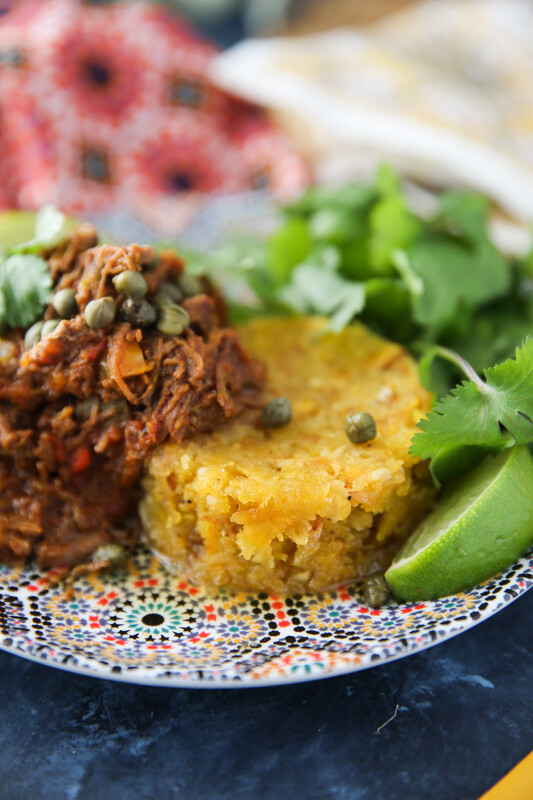 Lastly, once the mixture is mashed into a dough, grease a ramekin or a cup and press the dough into it to shape the mixture then add to a plate and top with the ropa vieja and extra capers. 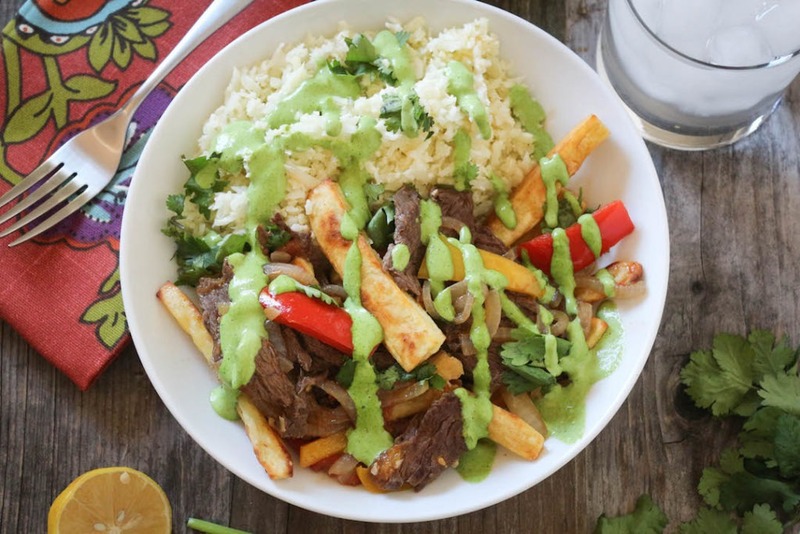 Garnish with cilantro and lime wedges for extra flavor! I absolutely loved it when you shared your version of Pastelon and I was super excited to see your version of Mofongo! Did you make it the same way that I had it growing up in Puerto Rico? Nope. Do you make pancakes and cakes and cookies the same way that I had it growing up? Nope. That’s why we come to your site, to see different (healthier) versions of the foods we love! Side note, look up Mofongo de Yuca or Cassava Mofongo. Super yummy, it’s just mofongo made with yuca instead of plantains and it’s delicious! Especially when you make the mofongo in the shape of a bowl and fill it up with shrimp in red sauce. Thank you for introducing a little bit of our Caribbean flavor to all of your readers!! 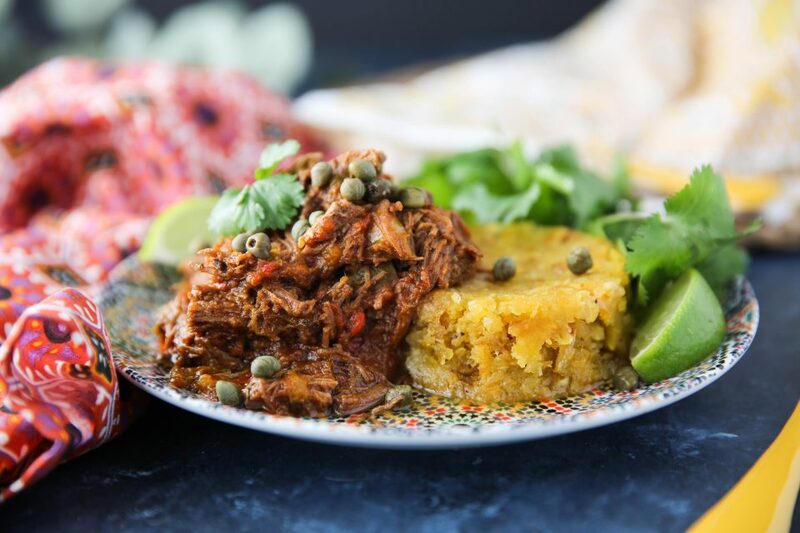 I gotta make that Instant Pot ropa vieja ASAP. Grew up in Miami, so it was a staple back home. And as a Puerto Rican obsessed with mofongo (as most are, I think), I have to say that yucca mofongo might be even better than plantain mofongo! And traditionally mofongo is eaten with chicken broth poured over, which elevates this dish even more and helps you get that bone broth intake in. SO good. Yessssss! 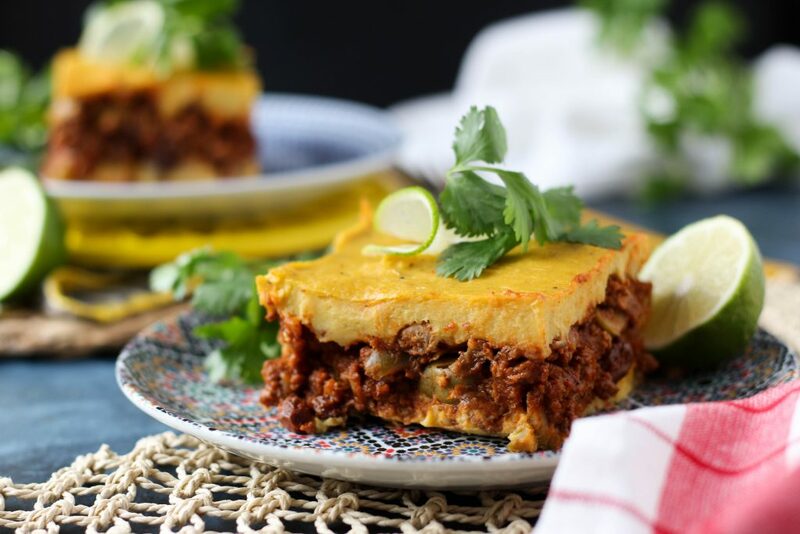 Keep these magnificent instant pot creations coming! How long would you suggest in a slow cooker? Looks delish! Is there something to use instead of lard? I don’t have any at home and don’t really want to buy another product. Thanks! In-n-out just announced they’re coming to colorado!! First of all, I love your blog, podcast and IG (ALL THE THINGS), but just wanted to say thank you for being overly detailed in your Instant Pot instructions. I’ve only used mine a few times and still feel like I don’t know what I’m doing when I cook with it so I appreciate the step by step explanation. Looking forward to making this delicious looking meal! I love the way you style your food and the fun cool plates and things you use! Excited to try this recipe! Just bought myself and Instant Pot and have no clue what to do with it!! 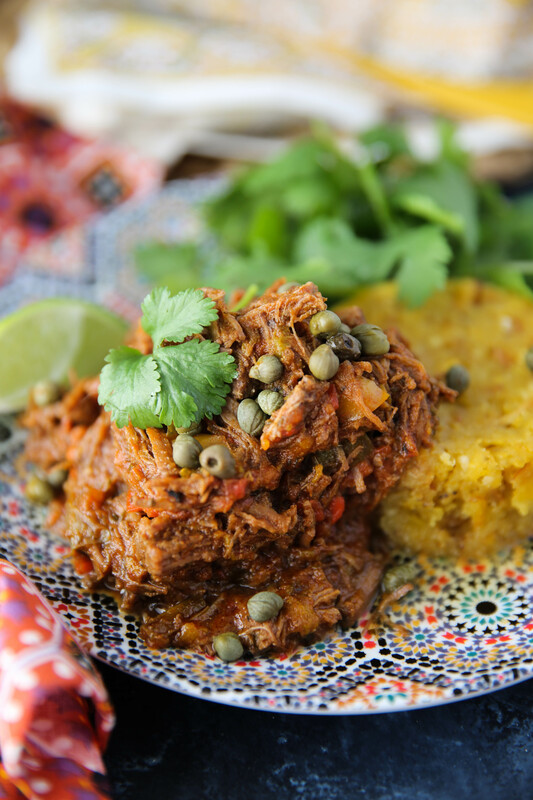 Kelly over at eatthegains said she was making this ropa vieja recipe last night, she storied it and it looked awesome. I’m going to have to break in my new Instant Pot and try this. I too have to ask if there’s something else I can use besides lard. My body hates lard! you could use bacon fat! Hi Juli, the recipe calls for a 6 ounce can of tomato sauce but the link is for a 15 ounce can, and I could only find a 6 ounce can of paste…Could you clarify which is needed? Thanks so much! sorry about that. it’s exactly what i specified, 6 ounces of tomato sauce. if you only can find 15 ounces, just use half. a little more than 6 ounces won’t make a difference! I loved this recipe! I really enjoyed your take on pastelon as well. I used a rump roast that didn’t shred as easily as I had hoped, but this was still super delicious. Even when I only had sauce left over, I threw some shredded chicken in and ate it that way. Hi Juli, I was planning to make the carne mechada from your book, I was wondering if it could be make in the instant pot, if so. How long should I cook it for. And should I put all ingredients at once? Thank you for all your delicious recipes your book is on a regular rotation in our house ???? I did the carne mechada from your book on the instant pot! I follow the recipe and put 2 cups of broth instead of 4. It turned out delicious!!! awesome!! so glad it turned out!